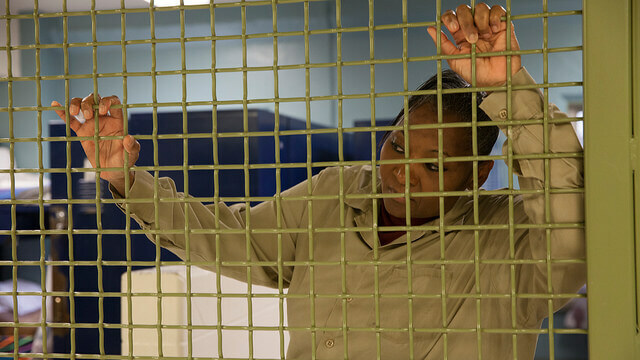 The rate of growth for female incarceration has outpaced that of males by 50 percent since 1980–and over 60 percent of women in state prisons have a child under 18, according to a national advocacy group report released just ahead of Mother’s Day. According to an updated fact sheet released by The Sentencing Project, the number of women and girls in detention ballooned from 26,000 to 213,722 between 1980 and 2016. The incarceration rate of white women in state and federal prisons grew by 44 percent between 2000 and 2016, compared to 12 percent growth for Hispanic women; while the incarceration rate for African-American women fell by 53 percent during this time period. Incarceration rates– and conditions– vary dramatically throughout the states. Looking at 2016 alone, the states with the highest rates of female imprisonment were Oklahoma, Kentucky, South Dakota, Idaho and Montana. Rhode Island, Massachusetts, New Jersey, New York and Maine were at the lowest end of the spectrum. Women in state prisons are significantly more likely to have been detained for property or drug crimes than their male counterparts, according to the report. And while 85 percent of incarcerated youth are boys, over 50 percent of youth incarcerated for running away are girls. Girls are also more likely than boys to be arrested for other low-level offenses such as truancy and curfew violations. The report also found that Native American girls are incarcerated at four times the rate as white girls, at 134 per 100,000 versus 32 per 100,000. African-American girls were found to be incarcerated at a rate of 110 per 100,000. The report also said Hispanic girls are 38 percent more likely to be imprisoned than white girls. A study published by the Texas Criminal Justice Coalition in April found that over 81 percent of incarcerated women they polled were mothers. Over 58 percent reported having been sexually abused or assaulted as a child. Forty-nine percent of the incarcerated mothers polled reported that they never see their children, while 27 percent said that they see their children once per year or less. Ninety-five percent of expectant women polled had been incarcerated for a non-violent offense. Women who responded to the survey say they had very little access to adequate health care; and some claimed their newborns were taken from them soon after birth. This summary was prepared by Victoria Mckenzie, deputy editor of The Crime Report.